Jason Snyder, aka The Renegade Chef, is standing out from the pack with his Michelin star, healthy, cannabis infused fusion cuisine. The culinary world is getting infused with canna-chefs trying to make their mark on the cannabis food market. Justin Snyder, aka The Renegade Chef, is standing out from the pack with his Michelin star, healthy, cannabis infused fusion cuisine. 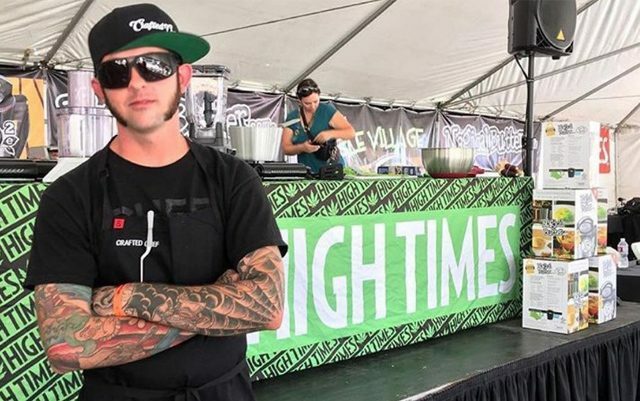 A finalist at the Cannabis Cup chef’s battle, Justin is emerging as a culinary force in the cannabis world. Based in California, he’s available for private parties, events, and fellow chefs to collaborate within cannabis legal states like Colorado. Most of the price is for cost for me. I don’t ever mix alcohol and cannabis. You’ll never see any wine pairings at my cannabis events. The responsible renegade also picks up your ride home, as an Uber ride is included in the price per plate. I don’t want anyone smoking or eating and driving. World traveler and classically trained chef, Justin Snyder, loves mixing it up when it comes to his fine dining experiences. There’s more to edibles than what you’re seeing. I want to give patients an alternative to shooting oil into their mouth if they cant eat solid foods. He’s currently in the kitchen working on a new process and technique to infuse ice creams and sorbets for those who can’t eat their medicine. It starts with his original, top quality recipes. The future of cannabis cuisine is vegan options, super foods enriched with nutrients – and cannabis. That’s why he founded his new company, The Renegade Chef Co.
It’s not just gummies and cookies anymore. His company’s movement is to transition Americans away from pills, and they also incorporate CBD. I’m trying to make noting look like it’s in a pill form, because that pill can be a trigger for some people – they see is as just another way to get messed up. The Renegade Chef Co. is working on a CBD gum, among other products for people who have to medicate daily – a much healthier option than eating brownies all day. It’s not easy and it’s still frowned upon in the greater culinary world. Know that it’s what you want to do, because it takes thousands of dollars and a lot of compliance to laws. You need a collective to setup and the required recommendations. It’s not as easy as it sounds, there are background checks too. It’s just like starting any other real business, but with even more scrutiny. You can’t just have dinners in California, also know that there’s not that much money in it. But his passion for going against the grain – and against the odds to bring Americans a healthier cannabis lifestyle is what makes him a true Renegade Chef.